Late last year Picture Polish re-released one of their glitter polishes with a new formula. I last showed Picture Polish Splash back in November 2012. Back then the polish was most definitely a layering polish and the glitter was quite sparse. Fast forward two years and the new version of splash has a thicker consistency, but all due to the fact that the polish is now packed with glitter. It's not a one coater, but you can easily achieve opacity with it now. This is how I wore Splash. 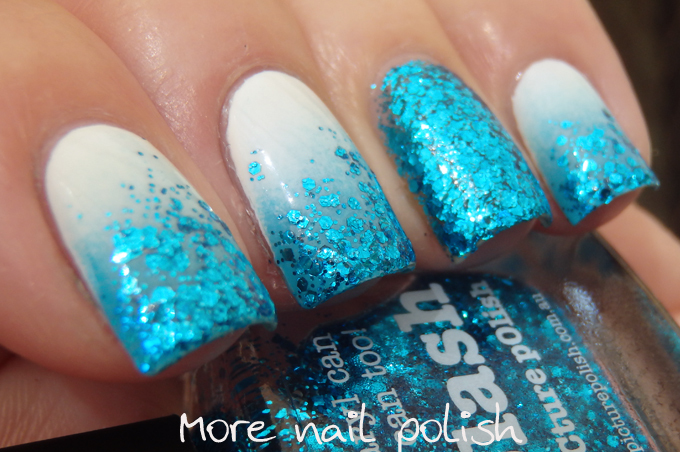 I started with a white and blue gradient using Picture Polish bright white and instinct. I then sponged on one thin layer of glitter onto the tips over the blue. On my ring finger and thumb I did two coats of Splash on it's own. When my little girl, Miss 4 going on 14 now that she has started pre-school, saw these she said "Oh mummy you have Elsa nails on. Can you pleeeaaassee do these for me". So today I did 'Elsa' nails on her, I just did the white base and a glitter gradient tip and she is very excited. I'd kind of given up polishing her nails because she's a picker. Every time I put polish on her she picks it off. She reckons she's not going to pick it off this time. I really should have taken a photo of her nails to include. Maybe I'll snap a photo with my iphone tomorrow when she wakes up and I'll post it to instagram. Picture Polish Splash is available from Picture Polish. International ladies may be able purchase through one of the many Network stockists if they have this in stock. This is so pretty. I'm wondering how the new(er) Splash compares with China Glaze's Feeling Twinkly? The way you have applied it is superb.